Shop Thrifty Nickel and GFB Auto 24/7 Online! Anyone who turned on a TV or radio last night heard about the senseless act of violence that happened at yesterday’s Boston Marathon. From all of us here at the Odessa/Midland Thrifty Nickel, we’d like to send our sincerest thoughts and prayers to all those affected by yesterday’s tragedy in Boston. Do you know where you can shop online 24 hours a day/7 days a week? Well of course you can accomplish this online with the wonderful OurThriftyNickel.com for all your advertising needs, but I’m talking about shopping for cars. General Fleet Brokers allows you to browse their wide variety of car and trucks online 24/7 using www.GFBAuto.com. If you’ve never been to General Fleet Brokers before then the time is now! Not only can you bring in your W2 and drive out today, you can also file your taxes on site! General Fleet Brokers makes it easy to get behind the wheel of a new vehicle. No previous credit is needed! If you have a job, residence, and a down payment then you’ll have a new vehicle to your name! Call now (432) 337-2886 or stop by and visit at 2346 E. 8th Street @ Cumberland. Bring In Your W2 to GFB And Drive Out Today! Wake up for another Monday folks! I hope everyone had a terrific weekend no matter what you did. Maybe you stayed inside and enjoyed some quiet relaxation to make up for that hectic 40-hour workweek. Judging by all the traffic I saw out on Saturday night, I’d venture a guess that most of you traveled outside the house for some fun. Do you know the easiest way to place your classified ads after Thrifty Nickel’s store hours? Over the worldwide web of course! You can place all of your classified ads no matter what category they fall under using our handy website. Just head on over to OurThriftyNickel.com and click on the ‘Place An Ad’ tab. From there just select the category you’d like your ad to appear under and type it up. It’s the easiest way to place your Thrifty Nickel ads any time, day or night. Are you feeling like you’re in desperate need of a new car? Tired of driving that old rambling wreck? Quit worrying about how you’re going to afford a new car and let General Fleet Brokers help you out. At GFB they finance you, doesn’t matter if your credit is top notch or bottom of the barrel. You can even bring in your W2, and drive out with your dream vehicle today. Stop on by at 2219 E. 8th Street just off Meadow in Odessa or view their inventory online www.gfbauto.com. When you sign the dotted line for that beautiful new car or truck be sure to tell them that Thrifty Nickel sent you. GFB Auto Is Here To Help! With the Thanksgiving only three short days away, many of us get to enjoy a short work week and the opportunity to spend time with friends and family Thursday. All of us here at Thrifty Nickel will be enjoying a little time off and this week’s paper will be delivered to newsstands on Wednesday instead of Thursday. So be sure to pick up a copy to go with that extra helping of stuffing you’ll be feasting on. Our sincerest thoughts and prayers go out to all who were killed or injured in Thursday night’s terrible train wreck during the Hunt For Heroes Parade. Please keep these individuals and their families in your prayers as well. Do you hate your current car? Want to get into something nice before the holidays? General Fleet Brokers can be the dealer to help you out. Credit Hombre is stacking em’ deep and selling em’ cheap for the holidays. 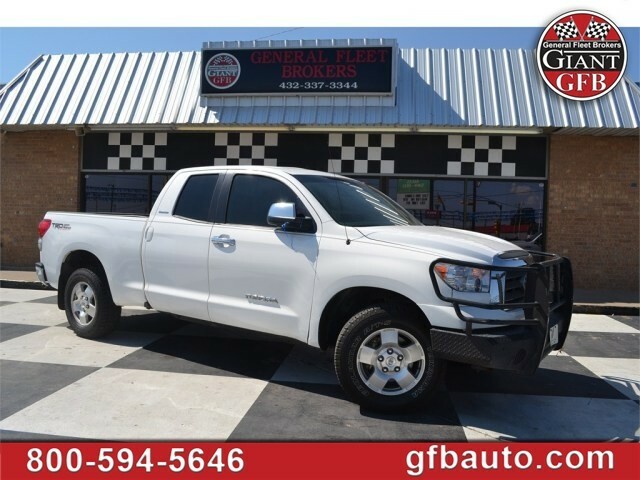 How about a 2008 Toyota Tundra 4X4, TRD Off Road Limited? Or maybe a 6 spd, 6’’ Lift, 2006 Rubicon with bumper & winch, and black on black wheels! GFB Auto will help get you the financing you need to drive off the lot in a new ride. Stop on by and see them at 2219 E. 8th @ Meadow or call (432) 337-6700.